Cardston, Alberta--(Newsfile Corp. - July 18, 2018) - American Creek Resources Ltd. (TSXV: AMK) (OTC Pink: ACKRF) (the "Corporation") is pleased to report the commencement of a significant drill program on the Treaty Creek Project, immediately adjacent to and in the same hydrothermal system as Seabridge Gold's KSM property (largest gold deposit in the world by reserves) and Pretium's high-grade Brucejack mine. Treaty Creek has similar geophysical, geological, and structural signatures to its neighbours with potential for similar scale. The 2017 Copper Belle zone resource delineation program comprised 27 drill holes with intercepts containing long intervals of gold mineralization (an estimated 13,722m total). A block of delineated mineralization from all historical drilling will form the basis for a preliminary resource estimate. Another 8 to 16 holes to depths of greater than 700 m are recommended in order to publish a preliminary resource estimate. A geophysical (MT/mag) anomaly under Copper Belle (B in Figure 1) shows a strong continuation of mineralized structure that is open to the north, west and to depth. This was verified in the 2017 drill results and supports the priority focus for 2018 drilling on the Copper Belle extensions. 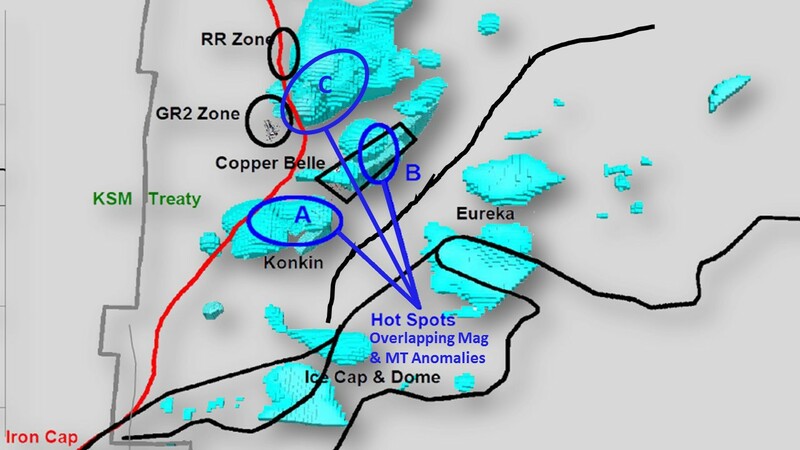 The Konkin Zone MT/mag anomaly (A in Figure 1) is another high priority exploratory drill target that previously generated 870 g/t Au over a 1.2m channel sample. Walter Storm, President and CEO of Tudor Gold, commented (June 4th, 2018): "Our first priority now is to complete the work for our resource estimate followed by drilling other exciting targets confirmed by Simcoe Geoscience. The consolidated geophysical survey that combined acquired data from Magnetotellurics (MT), magnetometer (Mag) and electromagnetic (EM) surveys has provided Tudor with several high priority anomalous drill targets. We expect that this summer's drill program will be very busy." The 2016 Magnetotelluric geophysical survey program ("MT Survey") was effectively utilized as a guide for the drill program. The MT Survey suggests that the mineralization continues to the southwest, toward the Iron Cap deposit of Seabridge Gold Inc. The MT Survey also suggests that the mineralized zone is open along strike and to depth. Simcoe Geoscience has previously provided the Magnetotelluric surveys and interpretive guidance for Seabridge Gold and Pretium Resources in targeting what have developed into world-class discoveries on these neighbouring properties. More Core Diamond Drilling Services of Stewart B.C. (owner Sean Pownall) will carry out all the diamond drilling and will manage the camp activities in 2018. More Core has extensive experience drilling on the Treaty Creek claims having conducted successful programs previously for both Tudor Gold and prior rights holders. Also, once again, Tudor has selected Yellowhead Helicopters Ltd. (YHL) to provide service. YHL has provided safe and efficient service for the Treaty program for the past two years.